Jupiter already had the most moons in the Solar System, but now scientists have discovered twelve new ones bringing the total up to 79. They were first spotted last year by a team of astronomers originally on the hunt for the elusive Planet Nine, a hypothetical body speculated to exist beyond Neptune. Unfortunately, they couldn’t find the hypothesized planet using the Blanco 4-meter telescope at Cerro Tololo Inter-American in Chile, but they did manage to unearth a treasure trove of new satellites around our largest planet. “Jupiter just happened to be in the sky near the search fields where we were looking for extremely distant Solar System objects, so we were serendipitously able to look for new moons around Jupiter while at the same time looking for planets at the fringes of our Solar System,” said Scott Sheppard, a researcher at the Carnegie Institution for Science, a private, nonprofit organisation based in Washington, D.C. The twelve moons have been broadly clustered into three groups. 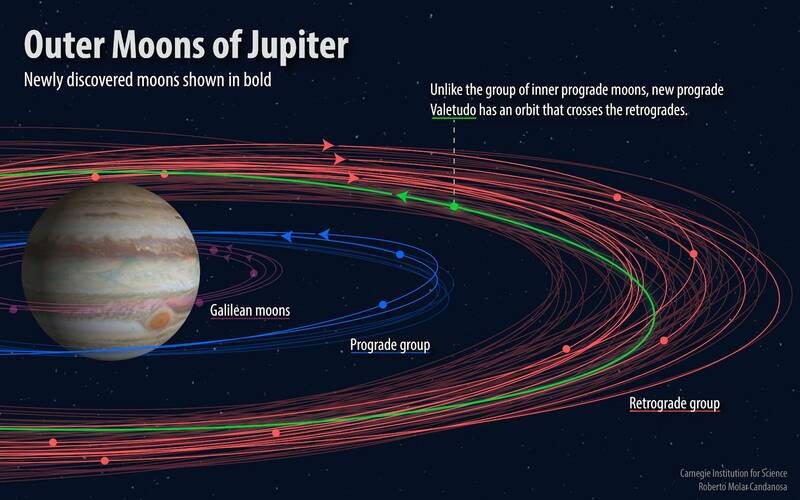 Nine of them have retrograde orbits, going in the opposite direction to Jupiter’s spin. Two of them go round in a prograde motion, in the same direction to Jupiter’s spin. And one of them has a very strange trip around the planet, leading it to be dubbed an “oddball”. “Our other discovery is a real oddball and has an orbit like no other known Jovian moon,” Sheppard said. “It’s also likely Jupiter’s smallest known moon, being less than one kilometer in diameter”. It has an angled prograde orbit that takes about a year and a half to complete. The retrograde set of moons take about two years to complete a lap around Jupiter, and the prograde ones take under a year. Since it’s more distant than the other prograde moons, the oddball crosses the path of outer retrograde moons. Diagram of the new moons split into different groups. Image credit: Roberto Molar-Candanosa, courtesy of Carnegie Institution for Science.